On this page you will find an overview of some more decorative concrete techniques. Once again I will just be giving an idea of the possibilities and leaving the specific "how to" details to separate pages. Don't forget the warning and tip on the previous page about keeping the surrounding areas clean! Here is another one. Think about this, By a using decorative concrete technique be it polished concrete or stencil concrete, you are trying to make a statement, to attract attention to the fact that your place is different! The last thing that you want is to attract your visitor's attention to a dirty great crack or other fault in your concrete. The point that I am making here is that you MUST pay attention to doing the best job possible. Review your concrete basics. Get your quality, thickness, curing, expansion joints right! A fault in an otherwise impeccable decorative concrete slab will stick out like dog's balls. Decorative elements added to the mix. Decorative concrete - An polished concrete entrance. In the photo above, the random looking white dots on the floor are probably pieces of quartz or marble aggregate. Standard concrete does not normally have these in it, (unless you happen to live in an area where it is the predominant rock). These extra pieces can be spread on the top of the concrete while it is still wet, as I detailed on the previous page, or they can be added to the whole of the mix at the concrete batching plant. Adding decorative concrete ingredients to the whole of the concrete mix at the batching plant can take a few different forms. Different coloured aggregates (stones) that are not normally seen in your area. Using white cement rather than the standard gray cement. This gives a lighter finish to the decorative concrete no matter what the colour of the sand and aggregates are. White cement has long been a favourite choice of terazzo workers. Using powdered products like various natural ochres to change the colour of the mix. Note: all ochres are not equal, some are very intense and colour the concrete well and others are less so. There is a technical limit to how much of these products can be added to the mix before the quality of the decorative concrete suffers. You may add a black ochre, but don't expect black concrete. It will dry out to a darkish gray. Adding liquid dyes or stains to the mix also changes the appearance giving a richly deep decorative concrete. You may think that adding something to the whole of the mix is wasteful compared to just sprinkling smaller amounts on the surface of the wet concrete. You are right of course, but as in most things there are pros and cons. Here are some reasons to make the whole of the decorative concrete different at the batching plant. The main reason is CONSISTENCY. The concrete plant adds the various ingredients very accurately and the are mixed evenly though out the concrete. This way the finished decorative concrete has a known, repeatable quality and appearance over many different batches. For house floors and other slabs containing steps or concrete stairs themselves the vertical faces of the concrete (and in some cases the underside) has the same appearance as the top surfaces. Broken off corners and small chips are not as glaringly obvious as chips through a surface coating. This follows for all concrete, but damage to polished decorative concrete in general and kitchen bench tops in particular can often be ground out with little or no noticeable effect. There are of course some drawbacks to doing it this way. Quite simply COST. It is more expense. If some of the materials are exotic and have to be specially ordered then there is a need to know the quantities required well beforehand. Good planning is needed and spur of the moment additions or extras are out. If the material being used is a one off, the first time that the company has used it then there is always the possibility of complications. I am speaking from experience here, we poured two lots of 45cuM. each into a house, that consisted a white quartz aggregates trucked in from interstate. We also used white cement to further confuse the issue. The first pour was extremely difficult. We had a very sticky mix that was extremely hard to pump, we got the job done slowly but it could easily have been a disaster. For the second pour we had a lot easier time as the engineers at the concrete suppliers were able to adjust the mix to make it easier to pump. The process of taking a trowelled and off form concrete floor into an attractive, sometimes stunning, long lasting and low maintenance floor is in many cases a long and expensive one. It is not to be undertaken lightly. Bear in mind though that the cost of a polished concrete floor is offset considerably by the savings on installation and maintenance of other alternative methods of finishing or covering the floor. The cost of adding polished hardwood or ceramic tiles ceramic tiles is saved. The actual concrete mix may have special constituents that makes the basic product more expensive than normal. The actual grinding process of using various machines with differing grades of diamond grinding wheels and polishes is time consuming. For outside surfaces, in the weather the process is not as demanding as inside work. There is not the need for a highly polished surface that could be dangerous when wet. The trick is to bring out the beauty of the concrete with fairly coarse grinders and seal (if at all) with a matt finish. In my experience most people seem to settle for second best when finishing internal floors. They "chicken out" at the end for cost reasons. They neglect the most important part, the finish surface coats. 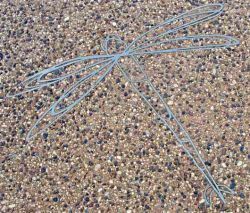 Decorative concrete - A plasma cut dragonfly design like this can be set into concrete counter top and ground and polished. Do a quick Google search for "concrete counter tops". There are thousands out there. Most of them are made to measure in off site workshops and to my mind are less than inspiring. Quite frankly if you go that way then natural stone looks better. All you are getting is another version of Terrazzo. I see the great possibilities of decorative concrete counter tops as being in the area of cast in place concrete. The whole idea of building your own concrete counter tops only becomes interesting if you want something totally unique. The creative possibilities in this field are endless. The use of different colours and aggregates in different areas to form interesting designs and patterns comes to mind. Free form shapes are an immediate possibility. We are no longer constrained by the rectangular shapes of the past. There are an enormous range of common or garden objects that can be used as inserts into the wet concrete that when ground down an polished may give amazing or unusual effects. For example a car fanatic may cut cross sections a couple of old pistons and con-rods and incorporate them into the design. If you are building a bar top, try sectioning a few glass drink bottles or beer glasses, not just across but length wise. Use the same diamond grinder that you will be using later for the polishing. My wife has a couple of small oriental cloisonne vases. They are decorated with two different really well executed Chinese dragons. It would be a fairly simple matter to copy these dragon designs and take them to a steel merchant and get scaled up stainless steel plasma cut outlines of them. I could fill each of the areas with a coloured epoxy concrete and then incorporate them into a truly different one of a kind concrete counter top that in itself is a modern type of cloisonne technique. Decorative concrete - Section of a cloisonne vase about three times life size. 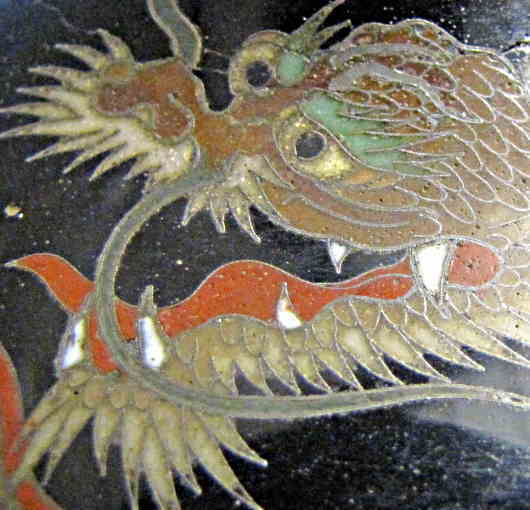 Cloisonne ware consists of metal, usually copper objects that have designs created with metal borders. These borders are then filled with enamel and polished flat. A design like this could be created in counter tops. The beauty of this technique is that it lends itself very well to small arts and crafts pieces and a diy-er can build a skill base before committing to a larger project. decorative concrete grinding and polishing the process. I will be going into this in detail in another page with details of the tools used. In the meantime here are a few pointers. I have hired grinding machines with the operator in the past, and while they did good work, Invariably it was on an hourly rate. As I was a contractor and had already given a fixed price for the job this was hardly ideal. The people that grind floors have many variables to cope with. The concrete, or in particular the aggregate used to make it, may be hard or soft. The slab may be perfectly flat and a pleasure to grind with a full cut being done at each pass of the machine, or may have waves or hollows in it that require hours of extra grinding to remove. These factors have an obvious relationship to the labour cost of the work, but also diamond wheels, discs, or plugs have a finite life span so there is a consumable cost per hour as well. There are no set specifications for grinding floors, it is not like say, painting, three coats:-this, this, and this to get the required finish. As a result anyone in the business of floor grinding does not like giving a fixed price for the reasons already mentioned, but also that he may have one idea of when the work is finished and the owner or client may have a completely different idea of when the work is acceptable. So as far as I can work out, if there is a lot of concrete grinding to be done, don't expect to get a fixed price. The last job that I did that had polished concrete floors, we bought our own grinding machines and saved a considerable amount of money. If you have existing concrete floors, let's say they are patio areas that you would like to spruce up. Even make like new. Then you have a few options to think about. The resurfacing job is only ever going to be as good as the old concrete. By that I mean that most methods rely on the old concrete being in fairly good condition. Be immediately suspicious of any contractor that says he can cover up serious large cracks in the old concrete. I am not talking about normal small shrinkage cracks here, but cracks caused by underlying faults in the slab . Rip it up and put in a new slab. Use the old stuff as a base and pour a topping of new concrete on top of it. Old garage floors with heavy oil stains can only be partly cleaned by using a liquid detergent and a water blaster. Much oil will still be impregnated in the concrete and the only thing that I know that will bond to it successfully is an oil based paving paint. Staining. After cleaning or even grinding the old concrete can be surface treated with various stains to give it a deeply rich effect. Internal floors in particular look great when stained. You can compare it to the difference between plain pine timber and stained timber that gives it a rich hardwood look. 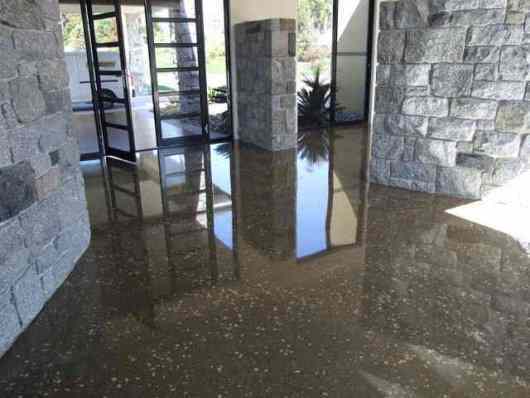 Staining relies on the fact that concrete is porous and the stain can soak into it. So it needs to be in good condition without contaminants that would block the even spread of the stain. Cracked concrete is not a good platform for staining, as methods to fix the cracks block the stain. Cracks if left alone only get accentuated by the stains. Ground and polished. This can be done just the same as new concrete can, though in some cases it is likely to be harder to do. It can be used alone or in conjunction with other methods like staining. Polymer based coatings.After cleaning and patching of small cracks and spalling these coatings are sprayed or rolled on. These are usually applied with an airless spray gun and come in various textures. NOTE! As in most things not all of the contractors that do this sort of finish are equal. Some of the ones that I have seen doing this sort of work are similar to the "Roof Sealing" contractors that promise the earth, grossly overcharge but do little preparation to deliver on their promises. Check their credentials closely. Overlay stencil applications.These decorative overlay systems are based on an epoxy bond to the old concrete using the same stencils and textures that are used to create the stencils applied to new concrete slabs. The three main make or break points with any of these processes are:-- PREPARATION, PREPARATION, PREPARATION. (sorry for stealing the real estate guys slogan, but it is so important). I will be doing a separate page on preparing of slabs for overlays shortly, which will include identifying the different types of cracks and how to repair them. Watch this space!